The San Francisco Bay Area is ground zero for the healthy eating movement known as California cuisine, a philosophy that emphasizes fresh, lean foods grown locally. But just a few miles away from the celebrated restaurants, like Alice Waters’ Chez Panisse, which gave this food movement its name, sits the neighborhood of West Oakland, a region of 25,000 people that until recently had no options for grocery shopping other than the many corner stores that primarily carried alcohol and a narrow range of convenience food. 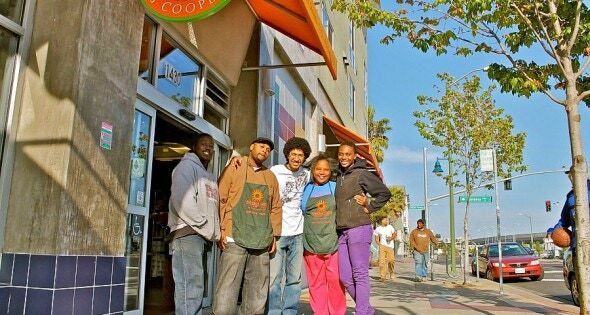 That began to change in 2009, when the 2,200-square-foot Mandela Foods Co-op opened its doors to the people of West Oakland. The small store boasts a healthy array of meat, dairy, produce, bulk goods, and other items you might expect to find on the shelves of a Whole Foods Market. Where did this healthy oasis in a food desert come from? Mandela Foods is a project of the nonprofit organization Mandela MarketPlace, which works in partnership with local residents, family farmers and community-based businesses to improve health, create wealth, and build assets through cooperative food enterprises in low-income communities. The idea for the store, though, came from West Oakland residents themselves when Mandela MarketPlace reached out to determine what they wanted. Establishing the community grocery store became Mandela MarketPlace’s first order of business. “When we sat down at the table, we realized there was no way that residents who wanted to own the store were going to get the investment they needed,” Cedeño recalled. “So we incorporated as a nonprofit to go after grant funding and provide loan guarantees. We incorporated in 2006, and Mandela Foods opened in 2009 with six worker-owners. Initially, Mandela MarketPlace helped with the business planning, training and legal procedures, gradually passing on more and more of the ownership duties to the store’s worker-owners. The space utilization of the store is impressive. Imagine a 7-Eleven-sized area stocked with a full variety of all the things you would expect to find in a higher-end market rather than lottery tickets, Big Gulps and 12-packs. In addition to fresh produce, there are wall coolers of local, organic meat and dairy products (including soy, rice, almond and coconut milk), bulk grain dispensers along one side of the store, and a rack of healthy snack foods in the center. The store has an onsite kitchen as well, in which fresh daily soups and lunch specials are prepared by one of the owners who took it upon himself to learn culinary arts. They are also working with a local low-income entrepreneur to open up a café on the premises, which will feature outdoor seating and take advantage of the store’s ample sidewalk space out front. Besides serving as an oasis in a food desert, Mandela Foods brings something else to the community: economic opportunity and empowerment. West Oakland is one of the Bay Area’s most disadvantaged neighborhoods, with a poverty rate double that of California and unemployment almost twice the national average. “Being a business owner puts you in a different echelon,” Cedeño said. But business ownership opportunities are rare here. “When you go to traditional investors, they’re never going to give money to people without credit history and without steady income,” Cedeño explained. “There are huge barriers for people in underserved communities in getting access to quality jobs. “Grocery is a hard business with tight margins, and I think a lot of people felt there was no way that these community folks could make this successful.” Though, according to Cedeño, they have. Dana Harvey, Executive Director at Mandela MarketPlace, seconds Cedeño’s pleasure with the store’s success. Harvey, who has been working with Oakland residents to improve their environment since the 1990s, was recognized by President Obama as a 2012 Champion of Change in Food Security for her efforts. For Mandela MarketPlace, the journey is a labor of love, and one that is likely to continue for a long time. To find out more, visit mandelamarketplace.org.